This year we are using the Magic Tree House books as my 2nd grader’s reading ‘curriculum’. I have organized them to correlate with what what we are learning in history and some times science. 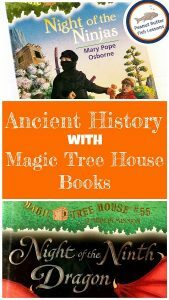 In Teaching History with Magic Tree House Books, I explain why we love these books, how they are organized, and give simple extension activities for using them in your homeschool or classroom. I also explain the difference between the Magic Tree House line of books (noted as MTH below) and the Merlin Missions line of books (noted as MM below). This list contains the books that cover the history of ancient times. These books would align with Story of the World Vol. 1 or other ancient history studies. Day of the Dragon King (MTH 14): Dragon King is a Chinese emperor who has ordered all the books to be burned and Jack and Annie try to save one book. Fact Tracker: China, Land of the Emperor’s Great Wall: contains facts about Chinese history and culture. Mummies in the Morning (MTH 3): Jack and Annie explore the inside of a pyramid. Fact Tracker: Mummies and Pyramids: learn about the ancient Egyptian culture including the details about mummies and pyramids. Hour of the Olympics (MTH 16): Learn about the original Olympics and why Annie had trouble attending. Fact Tracker: Ancient Greece and the Olympics: covers the history of the Olympics and ancient Greek culture. Stallion by Starlight (MM 21): Jack and Annie go back in time to meet Alexander the Great, king of the ancient Greek kingdom of Macedon. Fact Tracker: Horse Heroes: While this book does provide more detail about Alexander the Great’s horse, it would not make a huge contribution to a study of ancient history. But, if you have a horse lover in the family, it would be great! Night of the Ninjas (MTH 5): Jack and Annie meet ninjas and samurai warriors. Fact Tracker: Ninjas and Samurai: Learn more about ninjas and samurai warriors and what life was like for them in ancient Japan. Shadow of the Shark (MM 25): Jack and Annie visit the coast of Mexico and come in contact with a hungry shark. Fact Tracker: Sharks and Other Predators: This book focuses on sharks so while a great companion to the Shadow of the Shark book, it would not fit a study of ancient history. Vacation Under the Volcano (MTH 13): Jack and Annie travel to ancient Rome and arrive in Pompeii the day it is to be destroyed. Fact Tracker: Ancient Rome and Pompeii: This would be a great addition to an ancient history study as it contains many details about the Roman empire. Warriors in the Winter (MTH 31): Jack and Annie find themselves in a Roman camp surrounded by Roman soldiers. Fact Tracker: Warriors: This is a great book for a study of ancient history as it includes warriors from ancient Greece, Persia, and Rome. Don’t forget to check out Teaching History with Magic Tree House Books for easy extension activities and FREE printable reading comprehension bookmarks!